The stylish 580mm wide oval shaped counter top basin with a Summit high rise mono basin mixer, designed to be mounted onto a worktop console or piece of vanity furniture. The basin comes with no tap holes. Part of our range of designer bathroom products. Tap features a stylish contemporary sloping curved lever handle and a Waterfall effect slot shaped spout. Manufactured from solid brass with a shiny chrome finish. 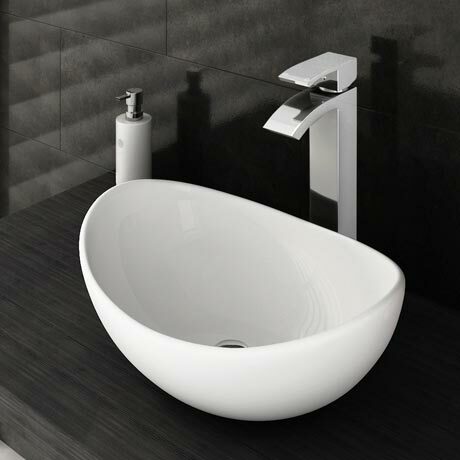 It's contemporary design will bring a touch of sophistication to your bathroom. Some small dimensional variation may occur due to manufacturing tolerances. "Nice, stylish sink. Has really updated our bathroom."